Web Intelligence Users - It's Time To Unplug Java - EV Technologies, Inc. If you updated your Java SE to last month’s Java 8 Update 171 (released April 17, 2018), you probably noticed a new dialog box in what has become a fairly routine update process. “Changes are coming which will impact your access to future versions of Java SE from Oracle. Corporate users will be impacted as soon as January 2019.” Oracle’s roadmap reveals some additional details. 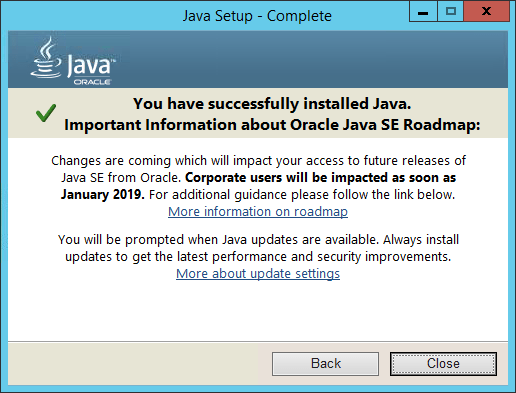 “Oracle will not post further updates of Java SE 8 to its public download sites for commercial use after January 2019”. This means that your organization will have to pay for Oracle support to continue to receive fixes. “Oracle does not plan to migrate desktops from Java 8 to later versions via the auto update feature.” This is good news for Web Intelligence users, as SAP has no plans to enhance Web Intelligence to support Java 9. If you haven’t already, now is great time to switch users from the Java-based edition of Web Intelligence to the HTML edition. And while you’re at it, now is a good time to go plug-in free with your Crystal Reports viewing and printing as well. If your organization is already using the SAP BusinessObjects BI 4.2 platform, you’ll notice that most of the gaps between Java and non-Java editions of Web Intelligence have been closed. If your organization hasn’t yet upgraded to BI 4.2, make sure “Java retirement” is at the top of the list of reasons to upgrade. Expect to see additional gaps filled with each successive support pack from SAP roughly every six months. SAP BI 4.2 SP6 is tentatively planned for July 2018 and SAP BI 4.2 SP7 is tentatively planned for January 2019. If your users are still struggling with feature gaps, consider using the Web Intelligence Rich Client as an alternative (remember that the Web Intelligence Rich Client also exists to support off-line access to the BI platform). It’s been a fun ride navigating the ups and downs of Web Intelligence and Java. And who can forget Webijavageddon? But with Google Chrome, Mozilla Firefox, and Microsoft Edge browsers all pursuing a plug-in free future, it’s time that we did the same. UPDATED: See also SAP KB 2656446 – SAP Official position regarding SAP BusinessObjects Web Intelligence Java Applet viewer, published June 19, 2018. What is your 2018 strategy for Web Intelligence and Java?